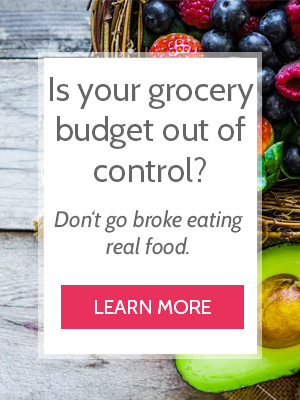 Save money and eat healthy the simple way. Here is how we prepare these nine easy make-ahead elements that we combine into flexible meals 20 minutes before dinner. If you’ve been on Pinterest for 4 seconds, you have heard of meal prepping and freezer cooking. It sounds like a good idea at first. And maybe you tried it. You printed the list, bought the groceries, and spent a couple hours packing freezer-to-crockpot meals into gallon-size bags. Maybe you loved it, and maybe you didn’t. There are lots of different ways to meal prep. In some seasons, the freezer-to-crockpot (or Instant Pot) method works. In some seasons, making whole meals ahead of time is better (check the link to learn from the make-ahead queen and one of my favorite foodies). And sometimes, we need something else. Something simpler. When we are trying to save money and eat healthy, we need shortcuts. We want to eat good food, but we aren’t full-time cooks, and we need help. I have tried a lot of make-ahead methods in our 10 years as a real-food family. Here is the most important lesson I learned. Seasons change, and our food changes too. You won’t find a method that works for you forever and ever. Life changes, tastes change, and while crockpot-meals worked really well during one season, they might not work in this one. If you want to save money and eat healthy, you have to be willing to learn, get creative, and try new things. Sometimes that means reframing how we look at make-ahead Meals. Occasionally, I still do big meal prep – pack the freezer bags, bake the oatmeal, plan dinner for a month and pre-make portions of it for seamless execution the day of. However, most of the time in this season, I have to take a different approach. Instead of planning entire meals ahead of time, we follow a simple, flexible, make-ahead structure. Similar to my tips for Keto on a Budget, instead of prepping whole meals, we prepare meal elements that can be combined into flexible meals 20 minutes before dinner. My favorite recipe is Deeply Flavorful Baked Sweet Potatoes. With one extra step, these baked potatoes don’t need any additional butter or brown sugar or maple syrup to make them my favorite side dish. This works especially well when you’re on Whole30 and can’t have any dairy or sweetener (as we found out on our Cheapskate Whole30). Whether you cook them on the stovetop, in the oven, or in the instant pot, hardboiled eggs are a simple, tasty inexpensive protein we try to keep on hand. If we plan to eat egg salad, we skip the peeling step completely and just make this game-changing (albeit horrifying-looking) egg loaf in the Instant Pot. Onion – Diced and frozen in a container or quart-size freezer bag. Celery – Sliced into sticks for easy snacking. The leaves go into our Broth Bag, and the if we don’t eat the sticks in time, I dice them and freeze them for soup. Lettuce – chopped and salad ready! I only chop enough for the next two days because lettuce browns quickly. Zucchini & Summer Squash – Whether you saute zoodles, dice it for breakfast bowls, or shred it for baked goods (like this allergy-free Sneaky Veggie Baked Oatmeal), squash is easy to prep in a few minutes. I tried lots of different graters (including my food processor), but this style (and this) is by far my favorite. Easy for kids and adults to use, and easy to clean with a brush. Peppers – Diced for breakfast bowls, and sliced for easy snacks. Our favorite bean base for burrito bowls, tacos, burritos, and chili. This recipe taught my family to love a bowl of beans. Cumin beans are easy to cook on the stove top, in the slow cooker, or with your Instant Pot, you can feed 6 people real food for around $3 and 5 minutes of work. The Only Chicken You Need to Make ensures we have chicken for the same purpose. I use an easy, fool-proof Instant Pot or Slow Cooker method to prepare our bone broth. Because here’s the truth: if it’s complicated, I won’t make it regularly. Our favorite, allergy-free baked oatmeal recipe. We serve it with maple syrup. Recently, as I’ve worked our sourdough starter into our real food routine, I experimented with simple, fool-proof bread recipes. Our favorite so far is this long-ferment Focaccia bread. What Can You Make With These Elements? We don’t prepare these every week, but they fall into our make-ahead rotation fairly regularly. Remember, no make-ahead method will work for us forever. Life changes, tastes change, and you probably even want to tweak this one to fit your needs in this season. What would you add or remove from this list to help you save money and eat healthy? Let us know in the comments! If you like this list or try these recipes, let us know! Leave a comment, rate the recipes, and tag a photo #cheapskatecook and @cheapskatecook on Instagram. Cheers, friends! I love this list! I’m not a big fan of sweet potatoes, but I’ll often “bake” potatoes in my instant pot to use throughout the week. Once those are done, I do hard boiled eggs, then a whole chicken, and finally chicken stock. If I do them in that order, I only have to wash my instant pot insert once at the end. PS – your granola recipe looks really yummy! I may have to make that this weekend. Awesome, Beccah! Thank you. Your list is brilliant – cheers for less dishes to wash!